Cloudy early with partial sunshine expected late. High 58F. Winds SSE at 10 to 15 mph..
A mostly clear sky. Low 36F. Winds WSW at 5 to 10 mph. Drew Edwards of Black Forest has been chosen as a Knight-Hennessy Scholar as he pursues a juris doctorate at Stanford Law School in Stanford, Calif.
Edwards graduated from the United States Air Force Academy with a bachelor’s degree in political science, and from Harvard University with a master’s degree in public policy. He aspires to improve public policy through a career in law. 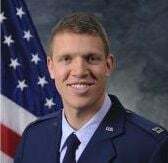 At the Air Force Academy, he was cadet commander for Expeditionary Survival and Evasion Training, superintendent for the 53rd Academy Assembly, and a two-year Division I men’s basketball athlete. Edwards received a full Presidential Scholarship to Harvard Kennedy School. At Harvard, he was vice president of the Armed Forces Committee. In the Air Force, he served as mission commander in the 2nd Space Operations Squadron, where he was recognized as Outstanding Officer of the Combat Rotation. Edwards has also been deployed to Al Udeid Air Base in Qatar.